Sidney donor Robert Slone receives a buckeye necklace from Larry Lokai. "Buckeyeman" Larry Lokai with Micah and Monica Overbey. Sidney donor Carolyn Miller with chocolate buckeye. It was the second year of co-sponsoring the blood drive and two groups go together like the Scarlet and Gray. 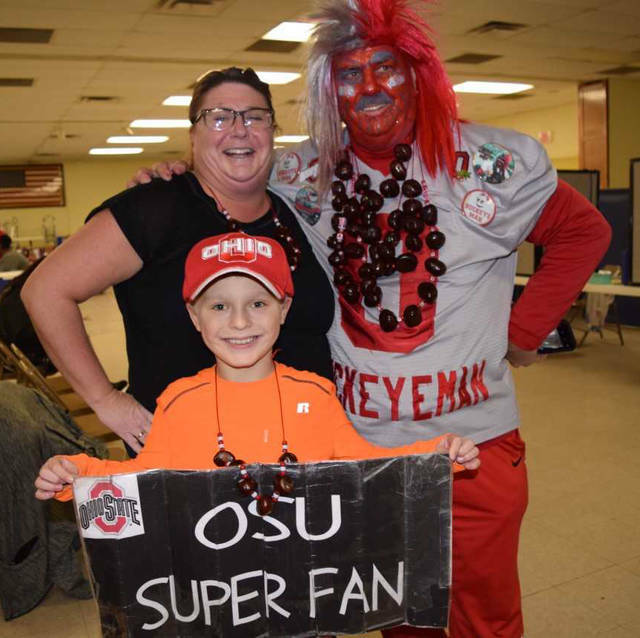 Last year, the blood drive took place during rival week before the Ohio State-Michigan game. This year came after “The Game” and Buckeye fans could bask in the glory of a surprisingly dominant win that catapulted them into Saturday’s Big 10 Championship. It also boosted enthusiasm to have two well-known Buckeyes boosters visiting the blood drive for the second year. Super fan “OSU Buckeyeman” Larry Lokai gave away homemade buckeye necklaces as door prizes and Coach Jim Tressel look-alike Dennis “Tress” Singleton schooled donors on Buckeye football history. Lokai first appeared in his alter ego of “Buckeyeman” at the 1998 OSU-Michigan game. It would shock most to know that the energetic super fan is age 76. “I started my 21st year,” he said. “It’s not like I’m getting old!” He made a sign for the TV cameras boldly predicting an Ohio State win. In the Donor Cafe donors talked more about the food than the game. The women’s committee served chicken salad sandwiches, homemade cookies, and of course chocolate-covered Buckeyes. The alumni club also faces the challenge of recruiting new members. 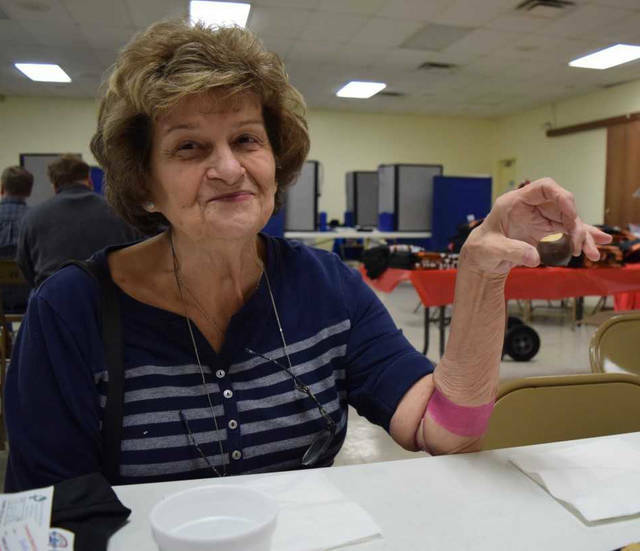 It wasn’t the “Snow Bowl” but donors braved below-freezing temperatures and snow showers to support the blood drive. It totaled 133 donors, including 119 whole blood donations and 10 platelet and plasma donations. 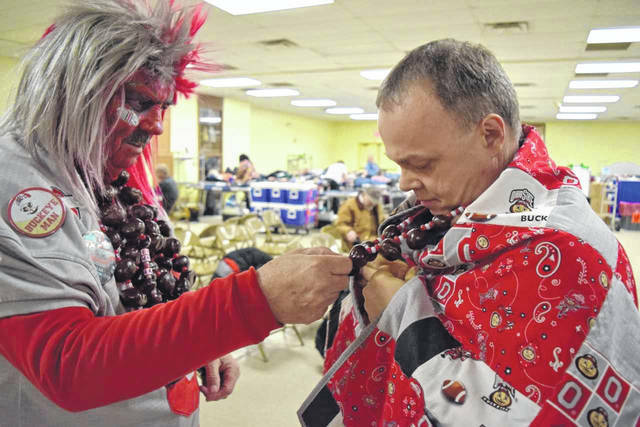 https://www.sidneydailynews.com/wp-content/uploads/sites/47/2018/12/web1_ForPrint-2.jpgSidney donor Robert Slone receives a buckeye necklace from Larry Lokai. Courtesy photo. https://www.sidneydailynews.com/wp-content/uploads/sites/47/2018/12/web1_ForWeb-2.jpg"Buckeyeman" Larry Lokai with Micah and Monica Overbey.Courtesy photo. https://www.sidneydailynews.com/wp-content/uploads/sites/47/2018/12/web1_ForWeb2-2.jpgSidney donor Carolyn Miller with chocolate buckeye.Courtesy photo.